It is a wonderful time of year. Spring is here and the opening day of baseball. The weather is becoming nicer and the days longer. 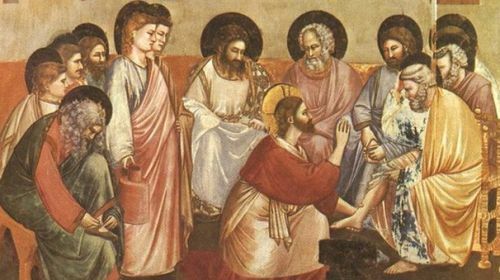 Lent has given way to Easter, and the Octave of Easter gives way on the following Sunday to “Divine Mercy Sunday.” It is another great reason to love the season. But, what is so great about Divine Mercy Sunday? Christ wanted to draw our attention to the immense importance of these two sacraments of Confession and Holy Communion. So much so, that Christ’s promise amounts to offering the graces of a complete pardon, or essentially a second baptism! Jesus reiterated these conditions and promise of a complete pardon at least two other times to her. (Diary, 300 & 1109) The “oceans of grace” available to us on Divine Mercy Sunday can make us anew and give us a fresh start again. We simply have to make a good Confession (such as the Saturday before) and stay in a state of grace up to receiving Holy Communion on Divine Mercy Sunday or the vigil Mass. Jesus requested we also do works of mercy whether deed, word, or prayer. But, the devotion was not always so. Initially, the Vatican had received erroneous and confusing translations of Sister Faustina’s Diary, and in 1959, censured the devotion and banned her writing. The ban would last 20 years, seemingly fulfilling a prophetic writing in the Diary that her work would “be as though utterly undone.” In 1965, Karol Wojtyla, the Archbishop of Krakow at the time, commissioned one of Poland’s leading theologians, Fr. Ignacy Rozycki, to prepare a critical analysis of the Diary. Then, on April 15, 1978, after receiving Fr. Rozycki’s analysis and a better translation of the Diary, the Vatican’s Congregation for the Doctrine of the Faith lifted the ban. The Congregation’s Nihil Obstat stated: “there no longer exists, on the part of the Congregation, any impediment to the spreading of the devotion to The Divine Mercy in the authentic forms proposed by the Religious Sister [Faustina].” Years later, on April 30, 2000, Karol Wojtyla, then Pope John Paul II, canonized Sister Faustina Kowalska and established the first Sunday after Easter as Divine Mercy Sunday. It had been assumed that such an overly generous and merciful grace as the remission of all sins and punishment would be impossible. Yet, any doubt was overcome and the Catholic Church universally embraced the message of Divine Mercy. As St. Thomas Aquinas points out: “Christ’s passion was not merely sufficient but a superabundant atonement for the sins of the human race.” (III.48.2) Since Christ is the divine Son who took on human flesh, all of his actions were “theandric;” that is, they were divine actions manifested in a human body. Consequently, all of His humanly actions were of infinite value and merit, and more than enough to satisfy divine justice for all of humanity. This is why St. Pope John Paul, who had been thinking about Saint Faustina for a long time when he wrote Dives in Misericordia (“Rich in Mercy”), could say: “This constitutes even a “superabundance” of justice, for the sins of man are “compensated for” by the sacrifice of the Man-God.” (DM, 7) Christ’s superabundance of grace leaves at our disposal an ocean of divine mercy greater than any sin. This is how Christ can promise us on Divine Mercy Sunday a complete forgiveness of sins and punishment. Just as Eve was drawn from Adam’s side while he fell into a “deep sleep,” so too, Christ’s Bride, the Church, was drawn from the blood and water that came from Christ’s side in His crucifixion. 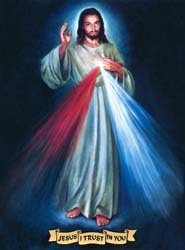 In the Divine Mercy image, red and white light is issuing from Jesus’ heart, symbolizing the blood and water of the sacraments for Holy Communion and Baptism. One of the main prayers Jesus taught Saint Faustina was “O Blood and Water, which gushed forth from the Heart of Jesus, as a fount of mercy for us, I trust in You.” Jesus is asking us to trust in the sacraments of the Church. The power of the Holy Spirit can make us new creations in Christ, particularly if we partake regularly in Confession and Holy Communion. Why not take advantage of Christ’s great promise this Divine Mercy Sunday? This entry was posted in Divine Mercy, Easter and tagged blood and water, confession, Dives in Misericordia, divine mercy, Divine Mercy Sunday, Easter, forgiveness of sins and punishment, Holy Communion, John Paul II, mercy, sacraments, Saint Faustina, superabundance, Theandric on March 27, 2018 by Brian. Easter is the momentous culmination of our Christian faith. As the “Feast of feasts” and the “Solemnity of solemnities,” the celebration of Jesus’ resurrection could not be contained to just one day in the liturgical calendar. So, we celebrate the Easter Octave – the eight-day festal period from Easter to the Feast of Divine Mercy. The grace and merit won by Christ on our behalf naturally flows from Easter Sunday to Divine Mercy Sunday. The Divine Mercy devotion is comprised of many aspects: the Feast Day, the image, confession, the great Promise and Indulgence, the three o’clock hour, the novena and finally, the chaplet. The power of the Divine Mercy chaplet is highlighted throughout St. Faustina’s diary, including the power to save the dying, the power to forestall divine justice, and even, power over nature. The Divine Mercy chaplet is a powerful way for us to show mercy towards others through prayerful intercession. It is particularly fitting during Eastertime with the chaplet’s Paschal and Eucharistic language. Each time we pray the chaplet, we offer to God the Father the passion and sacrifice of Christ, on behalf of our sins and for those of the whole world. It is a microcosm of the Mass in prayer form. The Divine Mercy devotion inevitably leads us to the sacraments, especially Confession and the Eucharist, which we can partake in this Sunday for the Feast of Divine Mercy. This entry was posted in Divine Mercy and tagged chaplet of divine mercy, divine mercy, Easter, mercy, St.Faustina on April 21, 2017 by Brian.